The handle attaches to two sections of approx. 1.25 in (3.2 cm) diameter shaft that slide one into the other. One section is obviously slightly smaller than the other to allow the telescoping action. Flat spring-loaded metal pegs in the handle and shaft sections lock into holes in the scoop and shaft to hold it in either fully extended (shown above) or collapsed mode shown below. The scoop is made of tempered aluminum. It has two holes in the front of the blade to allow use as a dead-man anchor or a rescue sled by running rope/cord through them. Below is a picture of all the separate pieces. In the 19 months I have owned this shovel it has been with me on eight multi-day trips. Three were in the eastern Sierra Nevada Mountains, two to the White Mountains, two at Mount San Jacinto and one trip to Mount Shasta. Temperatures have ranged from 12 F to 50 F (-11 to 10 C). Elevations have ranged from 7000� to 13200� (2100 to 4000 m) Snow depths have ranged from 4� (1.3 m) to God-only-knows. Snow conditions have run the gamut from fresh powder to old crud. This is my third shovel. The first was a nylon bladed model that while lightweight did not have enough strength or a big enough scoop to do serious digging with. The second was similar to this one but got left behind on a hike by Dave. (He paid for this one, thank you.) 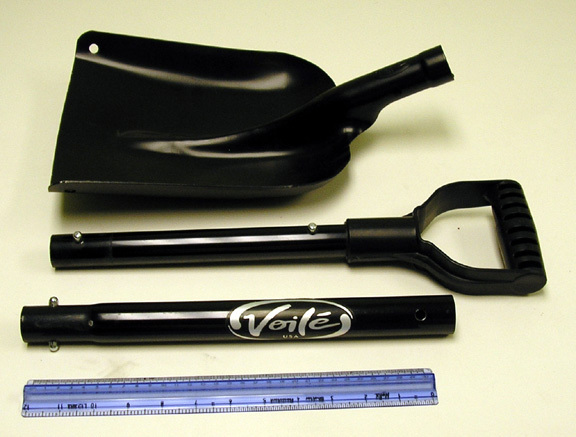 I carry a shovel on any trip that is on snow for a few reasons. The most important is for safety. In the event of an avalanche I may need to move a lot of snow in a hurry. It was when I started mountaineering that I changed to a wider, deeper metal scooped shovel. I also changed from a T-handle to the more secure grip of the D-handle on the TelePro. 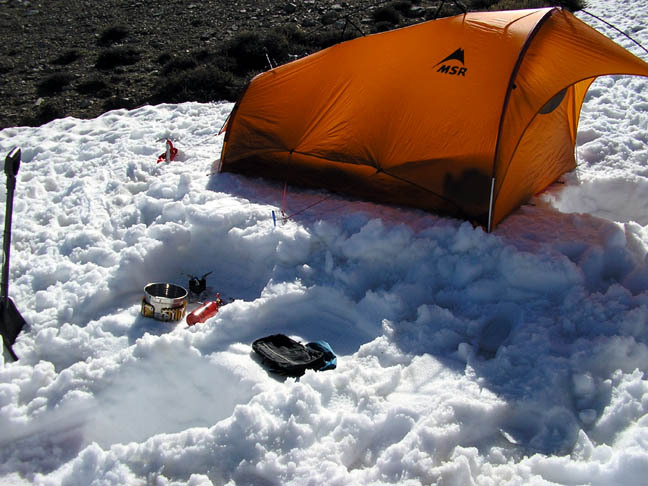 When on trips that have a choice of snow or exposed ground to set my tent up on, I almost always choose the snow covered site. 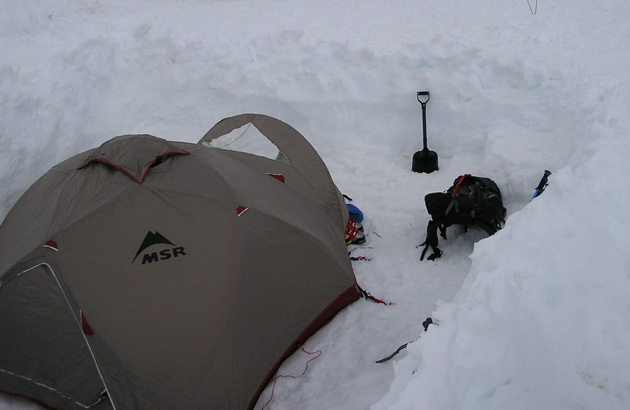 Everything stays much cleaner and I can use my shovel and snowshoes to make a nice level spot for my tent. I never have to worry about rocks or other sharp pokey stuff on snow either. In the picture below I moved a lot of snow from the uphill side and stomped it flat with my Lightnings to get this nice site. The last reason is to customize my camp sites. I dig an 18 in (46 cm) pit inside of my vestibule, in front of the door of my tent. It makes it much easier to get in and out of, and makes it more comfortable to put on my big winter boots. I also dig a kitchen area consisting of a hole six in (15 cm) deep and another in front of it about 2 ft (61 cm) deeper. This is my seat. To the right I dig a 1 ft (30 cm) deep by 4 sq ft (0.4 sq m) hole smoothed flat and level to hold my stove. This acts as a primary wind block. Here is a picture of one of my kitchens in the Whites. Notice the pit in front of the MSR Fling (see review) tent. On a trip earlier this year Dave used it to dig some very frozen-in snow anchors out. When doing so he hit the anchors and put some good burrs and dings in the edge of the scoop. (He is awfully hard on my gear.) I was able to draw-file the edge back down to remove the burrs. It still works fine and now has some added character. As an example of how much snow can be moved with the TelePro, I will relate a story from a trip to climb Mount San Jacinto. We took the tram up to Long Valley on a Friday after work and went a few miles to Round Valley to camp for the night. (We would summit the next day.) After eating dinner and melting the next day�s water we were bored and decided to dig where we thought the water pipe, a usually flowing tap the Forest Service had plugged into the creek, was. It was buried under seven feet of snow. With two ice axes and my shovel we dug a pit 8� (2.3 m) in diameter. We found the creek, but no pipe. I was about to give up when Dave said he could hear water running. We were about eight feet (2.3 m) off so we dug another 8� diameter hole at the pipe, throwing the fresh batch of snow in the first hole. We ended up clearing the pipe and cut steps down to it so that people could get water. I figured we cleared 11 or 12 sq yd (10 sq m) of snow taking turns with my shovel. We still laugh about folks thanking the puzzled Rangers for making the pipe accessible. All in all I really like the TelePro. The greater difficulty in packing the large scoop is more than made up by the strength and usability of it. Where�s the next pit to dig?